This entry was posted in Publications on 22/02/2018 by admin. L’Homme, M.C. 2016. Terminologie de l’environnement et Sémantique des cadres, In Congrès mondial de linguistique française (CMLF 2016), Tours, France. This entry was posted in Publications on 04/07/2016 by admin. 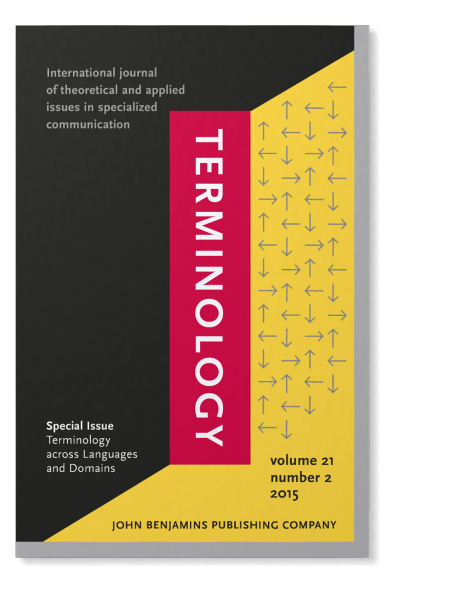 Issue 22(1) of Terminology is now available. This entry was posted in Publications on 20/05/2016 by admin. Issue 21(2) of Terminology was just published. 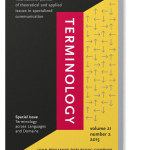 It is a special issue entitled “Terminology across Languages and Domains” edited by Patrick Drouin, Natalia Grabar, Thierry Hamon and Kyo Kageura. This entry was posted in Publications on 07/01/2016 by admin. This entry was posted in Publications on 23/12/2015 by admin. Alipour, M., B. Robichaud and M.C. L’Homme. 2015. Towards an Electronic Specialized Dictionary for Learners. In Kosem, I., Jakubíček, M., Kallas, J., Krek, S. (eds.) 2015. Electronic lexicography in the 21st century: linking lexical data in the digital age. Proceedings of the eLex 2015 conference, 11-13 August 2015, Herstmonceux Castle, United Kingdom. Ljubljana/Brighton: Trojina, Institute for Applied Slovene Studies/Lexical Computing Ltd. This entry was posted in Publications on 11/08/2015 by admin.